Hello! 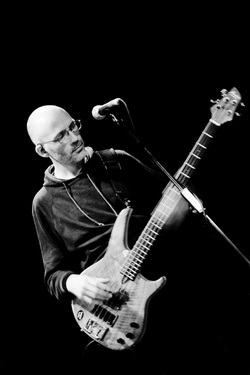 This is the page where you can find out about Chris and all things bass. I've been involved with music for over 35 years and my playing is predominantly finger style although I am known to use a pick on occasions. I am self taught and learned by"doing" i.e playing all the time with different musicians, but have used a few books and taken a few lessons in my time. I can play all styles including thumb and pop (slap) and also do some backing vocals as I have had singing lessons. I am a freelance musician playing all sorts of music with all sorts of bands - Currently my main work is as bassist and backing vocalist with the classic prog rock band CURVED AIR, which I have been involved with for the last eight years. I played bass and did backing vocals on the album LIVE ATMOSPHERE (recorded on tour in 2010) which was released in April 2012. The new CURVED AIR studio album NORTH STAR, on which I co-wrote seven tracks, was released on 17th March 2014 to some wonderfully positive reviews. I also perform throughout the South West with a number of bands and teach bass guitar at various colleges in the Devon and am free for sessions/ tutorials/ touring/ gigging when not working with Curved Air. I play fretted & fretless and also upright electric. I use a MANSON custom bass for most work but also use Fender Peavey & Yamaha basses plus a Dean electric upright. Based on a mix of status & Overwater shapes, Hugh Manson built this for me in 1998 using poplar for the body, as I requested a bass that was as light as possible without compromising playabilty and sound. He faced the poplar with walnut to aid strength and depth of sound. The neck is a maple/mahogany laminate with 24 frets. 2 x P35 active EMGS with vol/vol/tone controls, and a small headstock with lightweight alloy machineheads. The trussrod routing is at the body end to give strength to the headstock/neck join. The bass balances very well and weighs about 3.5 Kg. I can get any sound from the guitar and it's suitable for any style of music. I have been playing bass for over 35 years and have owned many guitars - lots of Precision copies, a Peavey T40 (weighed alot!! ), Tokai Jazz bass, Westone Thunder 111 fretless, Manson Kestrels (fretted & fretless and a 5 string Kestrel with a top 'C' rather than a low 'B' - weird), Shergold Modulator (see below), Status Shark, Hohner Jack, Ibanez soundgear fretless and a Pedulla Rapture fretless. I read about this in a book years ago and thought I'd try it on my Shergold - sadly there are no pix of the conversion although I did use it on an album recording by a band called The Cloud Cuckoos. I had 7 frets added to the fretless neck for the Shergold so I could slap n tickle thumb style at the bottom but play fretless at the dusty end of the neck - great sound as the fretboard was maple but the change over point at frets 7/8 was a bugger to get right. I sold the bass a few years later minus the half fretted neck which went back to being fretless. I then sold the neck to the same guy a bit later. Mainly MARKBASS and ASHDOWN with ASHDOWN ABM cabs for touring, plus an Ashdown little giant head -1000watts allegedly. In the past I have been associated with Carlsbro, Peavey, Eden & Trace Elliot heads and cabs. Originally I first owned a Selmer compact 30 2 x 12 valve combo with volume tone and "overdrive" switch to fuzz things up!! Just an ORCHID electronics muting DI pedal (or a Boss chromatic tuner), and an EBS multicomp to tighten up the top a little.